Katie Derham presents a lively mix of music, conversation and arts news. Live music comes from Mark Glanville and Marc Verter, plus Birds of Chicago. We hear from Fiona Shaw. Katie Derham presents a lively mix of music, conversation and arts news. Her guests include bass-baritone Mark Glanville and pianist Marc Verter ahead of their concert at the Purcell Room on Sunday. 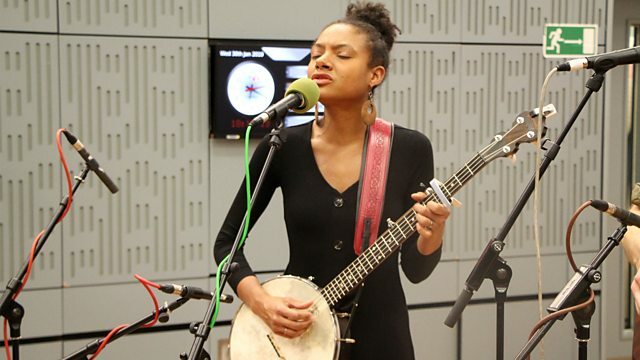 En route to Glasgow for the Celtic Connections festival, we also hear from Birds of Chicago who perform for us live in the studio. And Fiona Shaw drops by to talk about her involvement in a performance of Haydn’s Seven Last Words of Christ with the Casals Quartet. Orchestra: Chicago Symphony Orchestra. Conductor: Daniel Barenboim. Wagner: Overtures and Preludes: Chicago Symphony Orchestra/Barenboim. Performer: Mark Glanville. Performer: Marc Verter. Performer: Alison Balsom. Performer: Thomas Klug. Orchestra: The Deutsche Kammerphilharmonie Bremen. Haydn, Hummel etc: Trumpet Concertos: Alison Balsom. Haydn: Die Sieben Letzten Worte. Overtures (The Chamber Orchestra of Europe feat. conductor: Claudio Abbado). Orchestra: London Classical Players. Conductor: Sir Roger Norrington. Mendelssohn: Lieder Ohne Worte: Daniel Barenboim. Mozart Requiem Reconstruction of First Performances. Orchestra: Malmö Operaorkester. Conductor: Jun Märkl. Performer: Ottavio Dantone. Director: Ottavio Dantone. Ensemble: Accademia Bizantina. Performer: Pavel Šporcl. Performer: Petr Jiříkovský. Director: Adrian Chandler. Ensemble: La Serenissima.